Director: Barry Sonnenfeld; List Price: 14.95; Format: VHS; Rating: R; Release Date: May 1996; Sound: SurroundSound, Closed Captioned; Length: 105 minutes; UPC: 027616549334. Condition: Good. Blockbuster PVT with usual stickers on tape and back of cover. Cover is still in overall good shape, and tape plays well. Same cover design as that shown here. Movie Description: This slick adaptation of Elmore Leonard's 1990 novel features John Travolta as Chili Palmer, a Miami loan shark who's been sent to L.A. to collect on a bad debt from trash-movie producer Harry Zimm (Gene Hackman), the maker of the stunning flops "Grotesque" and "Slime People". But this is Harry's lucky day, because Chili is also a film buff, and when he's done talking tough he starts pitching Harry a script idea. As everyone knows, the best background for the motion picture industry is the criminal underworld, and Chili is smoothly launched into the life of a producer: romancing a B-movie scream queen, schmoozing superstars, getting reservations in the hottest restaurants in town. However, Chili's not the only mobster wanting to turn producer. It seems that a thug named Bo Catlett (Delroy Lindo), another of Harry's lenders, also wants a piece of the action. Add in a group of angry drug smugglers and there is an abundance of double- and triple-crosses, as well as plenty of wisecracks and Hollywood insider jokes. 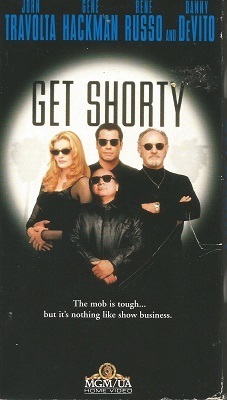 GET SHORTY crosses the line of life imitating art--and vice versa--many times, including the real Ernest "Chili" Palmer (on whom the character is based) playing a Mafia henchman. Barry Sonnenfeld's entertaining romp is a wild look at the celebrity life in Hollywood, featuring numerous cameos of stars playing themselves. Priority Mail delivery for this item costs 7.00 at the request of a buyer. 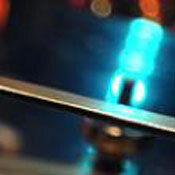 Otherwise, the shipping rate given here applies to orders shipped either First Class or Media Mail (depending on product type and package size) within the U.S. and to Canada only. Orders consisting of multiple purchases packaged together ship by any of these delivery methods at a discounted rate, usually for only 1.00 per additional item plus the shipping fee for the first item (determined to be the one with the highest delivery charge). International buyers: please contact us with your destination country for applicable base shipping rates. Multiple purchases that are packaged together save shipping costs for you, too! Payment is expected within two weeks of placing your order for the first item within a shipment. Paypal is preferred, but money orders and checks (either personal or cashier's) are also accepted. Orders typically ship within 48 hours of PROCESSED payment, excluding weekends and holidays. Inquiries from all shoppers are responded to promptly and courteously. Buyers are encouraged to ask questions prior to placing orders, as all sales are final unless the product you receive differs significantly from that which was advertised here in terms of either the product itself or its promised condition. Exceptions are made only in the event that a buyer is willing to return at his or her own expense an unopened, BRAND NEW item for a refund of the original purchase price only. No original shipping costs will be refunded, unless we are at fault for sending you the wrong item or misrepresenting the product and/or its condition. This hasn't happened yet, but if it does: you are guaranteed a refund of the purchase price, the original shipping fee, PLUS the cost to ship the item back to us. Thank you for looking!